Well, there have been no exciting blog posts out of me the past few days. I am at a loss for creative ideas. It has been a looong weekend. My Mom had a little setback...and she is back in the hospital about a week after her surgery. Lets just say a certain "Doctor" doubled one of her medications...in error. How the heck does that even happen?? But...she is recovering from that little episode now...so I am choosing to dwell on the happy things. I'm sharing another of my favorite "Mom" photos. It was May 1956. Mom & Dad were on their honeymoon in Florida. They had so little money when they were starting out. I love the thought of them tooling around South Florida in their old Chevy. Driving on the beach...sand on their feet and the wind in their hair. Life seemed so simple back then. Am thankful your momma is okay now. Hospital mistakes are tough on everyone. We try to make sure we have someone staying w/family members now. I know its not always possible...but there is much to be said for having a "patient advocate". Your photos remind me of my folks. What a shame this had to happen to your mom. Thankfully she recovered... eight kids! Wow, seven in my family, but I love all the company! The pictures you are sharing are gorgeous, they would make a beautiful wall display! I love the old photos you have posted of your parents. Everything did seem so simple back then. I hope your mom recovers quick and gets home soon! Love the old pictures, so fun to look at. I only have a couple of my mom when she was young. No camera??? Hope your mom feels better soon. Oh Mary- sorry to hear this about your Mom. It's becoming more common- unfortunately. Hang in there. Oh I'm so sorry to hear that your poor mom has to go thru that...sheesh...I do hope she is feeling much, much better now!!! I just love the favorite mom photo you've shared...too cool! What a great photo...I love simplier times. Sending lots and lots of well wishes to your mom. I am with you...that is a happy simple photo. All my best to your mom. The photo is gorgeous and perfect! Hope your mom keeps getting better - crazy how those little "errors" can cause such huge problems. Glad to hear she's on the upswing. I have heard that every patient in the hospital needs to have an advocate around. I can see by her photograph that your mama is a beautiful person, and that beauty is radiated from from the inside out. Here's to healthy mamas! 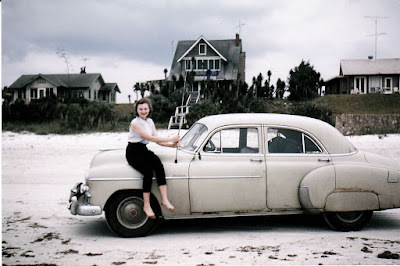 I love the photo of your Mom on the car, I have one of my (deceased) Mom that I do treasure. They all look so happy and carefree posing. Hope she is on the mend and I know she is being taken well care of. Lovely to meet you and your blog.Though don't have a clue how I got here, you know how that happens. I am currently lost in the words of Irwin and Helen...92 lovely letters from while he was away during WWII. The best read I have ever enjoyed. Ever. I’m a 30-something, vintage loving girl from Midwest. My heart is in the country, yet I find myself living in the city. I spend my days doing what I love. Running my own little business. Trying everyday to keep it from running me. I spend my nights dreaming of backroads, a big old farmhouse and living a life unscheduled. I am a homebody. Yet, I am a victim of wanderlust. I want to travel the world with my sweet husband. So come along for the ride. I will chronicle this crazy thing I call my life and all that entails. You will find a little bit of everything here...furniture makeovers, details of our travel, even a DIY saga or two as we reno our new home. can you buy happiness for under $20? giveaway alert...hurry the clock it ticking!